A modern piece of art by Corner Housewares. 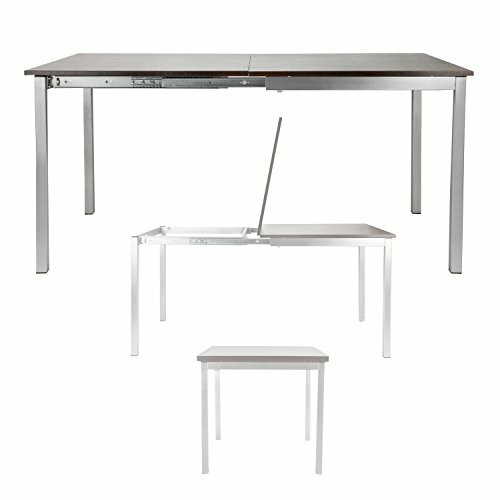 the steel dining table measures 63" L x 31.5" W x 30" H at Full Size and 31.6" L x 31.6" W x 30" H when collapsed. The table requires assembly upon delivery. A stunning and sleek table, The modern rectangular dining table features a modern design. The steel frame and a thick dark wood top make it a statement piece in the kitchen, dining room, or the office. An ingenious piece of furniture, the table transforms from a large rectangular 6-person table to a square 4-person table in seconds by simply folding the top and sliding the frame in. A functional and good-looking furniture in homes and offices. Established in 2010, Corner Housewares has been dedicated to creating and producing innovative furniture and houseware items of excellent quality at an affordable price. Our products are elegant solutions and are designed to make the most of your space. SpaceMaster Space Saving Design: When Fully Extended the Sliding Dining Table Measures 63" L x 31.5" W x 30" H. The Collapsed Table Dimensions Measure 31.6" L x 31.6" W x 30" H. The Dining Table Will Require Assembly Upon Delivery. Ultra Modern Design: A Modern Table Featuring a Steel Frame and Gleaming Dark Wood Top Finish. The Corner Housewares Ultra-Modern Design Makes Delivers a Functional Dining Room Statement Piece. Exceptionally Durable Design: The Table's Steel Frame Construction and Sliding Folding Mechanism Ensures Easy Adjustment and Reliable Stability in Both Forms. Ideal for Apartments, Dorm Rooms and Even Conference Rooms. Ingenious in Design: The Transforming Dining Table Can Easily Goes From a Square 4-Person to a Rectangular 6-Person in Seconds. Just Fold The Top in Half and Slide the Frame In To Turn The Table Into A Space-Saving 4-Person Table. No Separate Leaves to Store or Parts to Keep Track Of. Purchase with Confidence: Established in 2010, Corner Housewares Has Been Dedicated to Creating and Producing Innovative Furniture and Houseware Items of Excellent Quality at an Affordable Price. Our Products are Elegant Solutions and Are Designed to Make the Most of Your Space. If you have any questions about this product by SpaceMasterTM, contact us by completing and submitting the form below. If you are looking for a specif part number, please include it with your message.